This is supposed to be a rehearsal of some sort. I dont know for which event. I really want to just smile and shrug this off. I suspect this isnt what Pope Francis meant when he said that we clerics have to get out there. The next time they ask you to do something like this, and they will, please  be that guy? ALL of you? As I anticipated some people had a nutty about this, so I took down the photo I originally associated with this post. 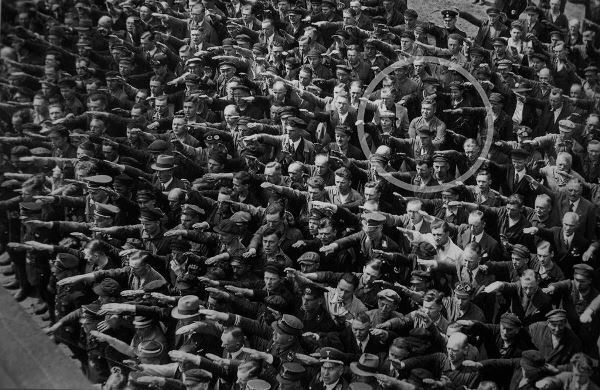 Yes, it was the well-known photo that sometimes bears the caption Be This Guy, or words to that effect. He wasn’t equating them with Nazis, he was saying they looked stupid. Which they did. However, Brazil is Brazil, and these were Brazilian bishops doing idiotic Brazilian things. This is something he should have known. I think Fr. Z shouldn’t have posted this with the comments that he made, but I also think that describing his post this way is seriously exaggerating it. Give them a break. They’re Brazilians. I take it you’ve never had to deal with Brazilians? The Pope’s homily and all his words to the bishops were very good today, and they might (and I hope will) get their act together. I take it youve never had to deal with Brazilians? Brazilians have had years and years of bad instruction. They are, however, very pious in their own way. The Pope’s talks to the Brazilian and Latin American bishops today were very good, and he was calling them back to the teachings of the Church. Some of the younger ones are fine, but a lot of the older ones are not so much bad as weak, and were pushed by the media and the academy into some very loopy things. Do not break the bent reed or quench the smoking flax. Encourage them, don’t say stupid things comparing them to Nazis. With all due respect to Pope Francis, we need a leader, not a social worker. His job is not to minister to the poor, but to make sure the various Catholic agencies that are supposed to minister to the poor are doing their jobs well. He is the only person who can do that. If he doesn't do it, it won't get done, and no amount of social work on his part can make up for that. Are you addressing me or Fr. Z?? And who hasn’t had years of bad instruction? Here in the U.S., Bernardin, Weakland, McCarrick, Mahoney, Hubbard, et al. come to mind. Not to mention O’Malley who has been appointed to the Pope’s “Round Table” of Dudley Do-Rights. But back to Brazil, Have you heard of the Lion of Campos, Bishop de Castro Mayer? Do you think we would have done the hokey-pokey with the other fools? Have you heard of Bishop Rifan? My mistake. That should be “he (Bishop Mayer) have done”; not “we would have done”. Thanks! Good for Mr. Landmesser. The headline is a complete crock. Not that it really matters. Cat fights in the blogosphere are nothing unusual as petty jealousies unfold. Two bloggers having a p***ing competition hardly amounts to news. Maybe I'll start a blog and pick a fight with someone. I will keep the combox CLOSED on this. I was a t a Catholic Mass once in a very German town. 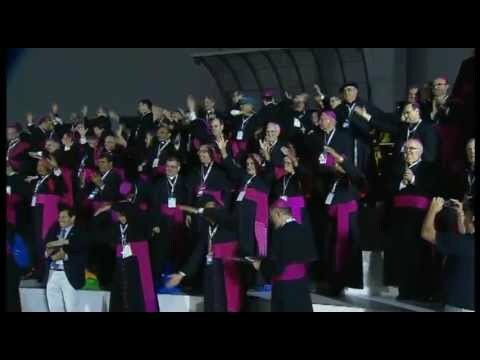 The Charismatic Catholic Priest, asked for everyone to raise their right hand to "call down the Holy Spirit". I think three people in the Church did not comply. I thought, "sheesh, dowes he not realize what would happen if someone took a picture of this stupidity?" I guess I just would like some decorum, instead of attempts at hipness. I still cringe at the memory of Dolan wearing a giant cheese on his head..
Go for it, Dude! I hope you find somebody; but I doubt it. No; you posted Fr Z’s sanitized version. Nice try. Wow, really got him on this post you did. It’s like you kicked a commedian for not being funny enough, except this was a priest who’s not intending anything hurtful. Bully for you satan! Father Z does a lot of satire. This is a joke, guys. But you know, this is the second overblown bashing of Father Z I’ve read recently (a UKTelegraph blog called him homophobic for telling the story of a Catholic woman killed by a gay in rage after she told him he was sinful). how do I do a Catholic prayer ping?